So, after the publisher gave me an ARC of Mortal Heart at ALA, I might have skipped away with utter joy and happiness. 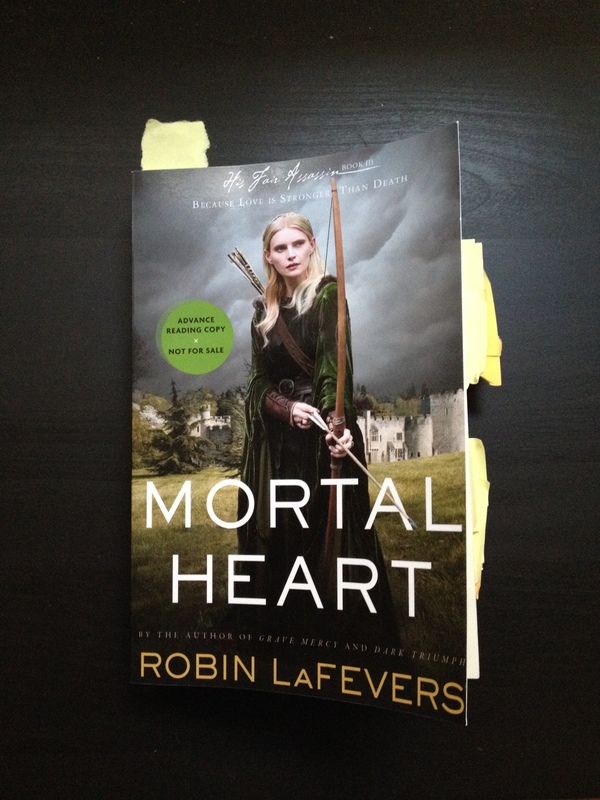 And I am pretty sure that after the hundredth time of showing people I had a copy of Mortal Heart, I became annoying. But I digress. I was really excited to read this book and LaFevers does not disappoint. As in Dark Triumph, Mortal Heart jumps right into the story of Annith. I love how LaFevers doesn’t waste anytime with a refresher of the world she has created. For those who have not read the other books in His Fair Assassin trilogy, the Convent of Saint Mortain, is an order of nuns that have supernatural powers, making them all uniquely suited to their roles as spies and assassins in Renaissance Brittany. The trilogy has focused on three handmaidens of Death, Ismae (Grave Mercy), Sybella (Dark Triump), and Annith. In Mortal Heart, we finally see how Annith fits into the bigger picture. Annith, is the best of the best. No one has worked harder to become a handmaid of Death. Both Isme and Sybella have been sent out to the world to fulfill their destinies while Annith has been stuck at the convent. When she is pass up once again for an assignment, Annith takes matters into her own hands and runs away, determined to find out the truth about herself and why she is never allowed to leave the convent. And boy does she discover the truth and not only about herself but also about the Abbess of Saint Mortain. We finally learn what the Abbess has been up to all these years. LaFever brings the trilogy to an end nicely and I am sad that the espionage, murder, and perilous fighting across the countryside is over. I have said this before and I will say it again, it usually drives me crazy the liberties that people take with historical fiction but LaFevers does a satisfying job of balancing history and fantasy in the trilogy. LaFevers does the complicated history of Brittany justice and does not give it a brusque nod that so many historical fiction books do. Mortal Heart comes out November 4, 2014. Again, a big thank you to Houghton Mifflin Harcourt Publishing Company for not only the ARC of Mortal Heart but Grave Mercy as well. I don’t think I would have picked up the series if it hadn’t been for the ARC and I would have missed out on all the fun. This entry was posted in Fantasy, Historical Fantasy, Magic, Young Adult and tagged Convent of Saint Mortain, His Fair Assassin, Mortal Heart, Robin LaFevers. Bookmark the permalink.